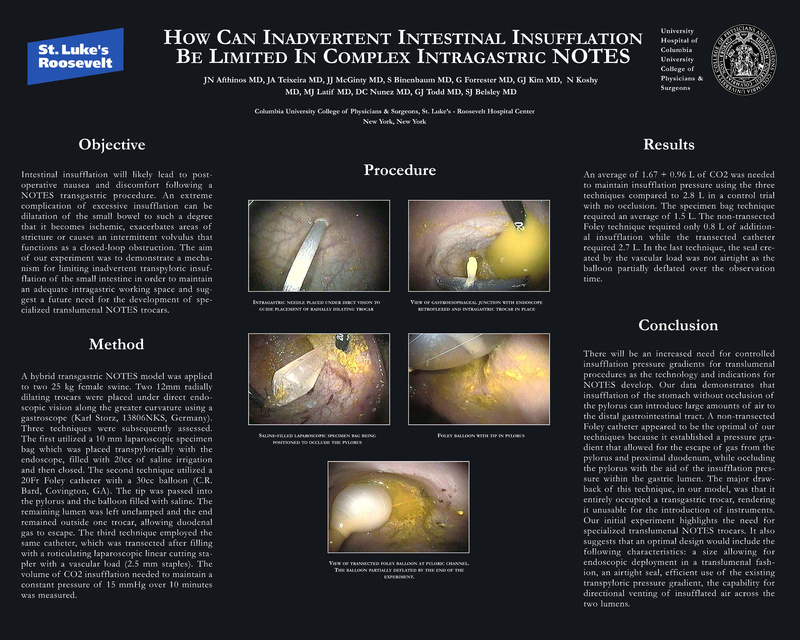 How Can Inadvertent Intestinal Insufflation Be Limited in Complex Intragastric NOTES Procedures? Objective: Early experience with transgastric NOTES in animal models have demonstrated the consequences of inadvertent insufflation of the small and large bowel. The resultant crowding of the intestines increases the risk of ensnaring the bowel during transgastric suturing. A mechanism for limiting transpyloric insufflation but permitting the necessary intragastric working space is needed. Description: A NOTES model was applied to two 25 kg female swine. Two 12mm radially dilating trocars placed under direct endoscopic vision along the greater curvature using a gastroscope (Karl Storz, 13806NKS, Germany). Three techniques were assessed. The first utilized a 10 mm laparoscopic specimen bag which was partially placed into the pylorus with the endoscope, filled with 20 cc of saline irrigation and then closed. The second technique utilized a 20Fr Foley catheter with a 30 cc balloon (C.R. Bard, Covington, GA). The tip was passed into the pylorus and the balloon inflated. The remaining lumen was left unclamped and the end remained outside one trocar, allowing duodenal gas to escape. The third technique employed the same Foley catheter but was transected after inflation with a laparoscopic linear cutting stapler with 3.5 mm staples. The volume of CO2 insufflation needed to maintain a constant pressure of 15 mmHg over 10 minutes was measured. Results: An average of 1.67 +/- 0.96 L of CO2 was needed to maintain insufflation pressure using the three techniques compared to 2.8 L in a control trial with no occlusion. The specimen bag technique required an average of 1.5 L. The non-transected Foley technique required only 0.8 L of additional insufflation while the transected catheter required 2.7 L. In the last technique, the balloon had slowly deflated over the 10 minute waiting period. Conclusion: The non-transected Foley catheter appears to be the most optimal because it established a pressure gradient that allowed for escape of gas from the pylorus and proximal duodenum. A drawback is that one trocar is entirely occupied by the catheter. Our data suggests a possible direction for the development of intestinal occlusion devices for future NOTES procedures.